The United States spends over $60 billion annually on nuclear weapons – more than the other eight nuclear-armed States combined. This colossal amount of spending on nuclear weapons is unnecessary, regardless of whether or not you support unilateral nuclear disarmament by the United States, or conditional nuclear deterrence until there is a multilateral nuclear abolition agreement by all nuclear armed States. Senator Markey and Representative Blumenauer have introduced the Smarter Approach to Nuclear Expenditure (SANE) Act, which calls for minimal deterrence (until global nuclear disarmament is agreed). 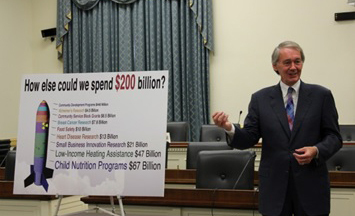 This could be served by cancelling some of the current (and proposed new) nuclear weapons systems, cutting at least 1/3 off the nuclear weapons budget and saving between $100 and $200 billion over the next ten years (Senator Markey is pictured above introducing the SANE Act). However, even this moderate approach can only get the support of a handful of congress-members. Why? Because the United States corporations manufacturing nuclear weapons and their delivery systems are too powerful a lobby for even the moderate democrats to oppose. Civil society must therefore employ other means to constrain the power of the nuclear weapons corporations and to build support for cuts in nuclear weapons budgets. Nuclear divestment is probably the most powerful tool at our disposal. Cities, States, universities, religious organisations, banks and other entities have funds which they invest in the stock market in order to get a return for their institutions and constituents. Many of these are investing in nuclear weapons corporations. By moving these institutions to divest from the nuclear weapons corporations, the nuclear abolition movement can spotlight the unethical behaviour of these corporations, help reduce market confidence in them, and put pressure on them to get out of the nuclear arms race. Such actions against the nuclear weapons corporations can also give political strength and cover to congressmembers who are wavering on whether or not to support nuclear weapons budgets cuts and initiatives such as the SANE Act. Move the Nuclear Weapons Money highlights examples of such nuclear divestment in the United States, and around the world. We also link to partner organisations and campaigns which have been undertaking nuclear divestment work. One such organisation active in the United States in the 1980s and 1990s was Nuclear Free America. They encouraged cities to declare themselves as nuclear-weapon-free zones and adopt ordinances which prohibited nuclear-weapons-related activities including investments in nuclear weapons corporations. Examples include Takoma Park (MD) which adopted a nuclear divestment policy in 1983 and the city of Oakland (California) which adopted a nuclear divestment policy in 1988. US organisations which have become active more recently include the Future of Life Institute and Nuclear Ban US. On 2 April 2016, Cambridge (Massachusetts) City Council adopted a resolution proposed by the Future of Life Institute to prohibit city funds from investing in nuclear weapons corporations. The institute has also produced a guide for nuclear divestment in the United States. Nuclear Ban US, which was established in 2017 after the adoption at the United Nations of the Treaty on the Prohibition of Nuclear Weapons (TPNW), is calling for nuclear divestment in the United States as a way for cities, states and institutions to give effect to some of the treaty provisions despite the fact that neither the United States, nor any other nuclear-armed State, have agreed to sign the treaty. On March 16, the Peace Walk for the People and for the Earth set off from Leverett (Massachusetts) arriving in Washington, DC on April 6. Several of the walkers carried Nuclear Ban US materials. As they visited cities along the way they encouraged the cities to adopt nuclear divestment policies and other measures to give effect to the TPNW. Please send us other examples of nuclear divestment policies adopted by US cities or other US institutions for us to include in our online database.